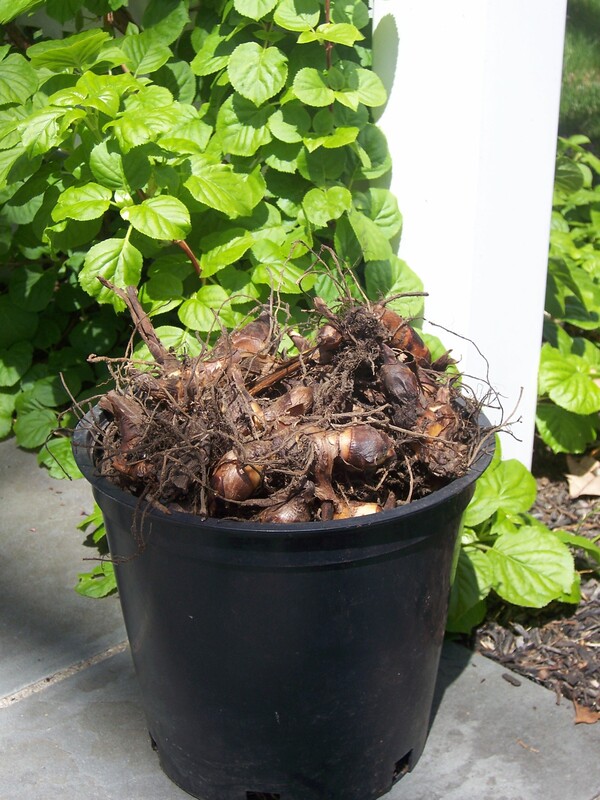 This weekend, I hosted a reunion of sorts — removing tender bulbs out of storage and reintroducing them to the garden. Newly planted elephant ears. They started to sprout while in storage. Each fall, right before the first frost, I cut back my tender plants, dig them up, cure them, and place them in paper bags along with peat moss to cover. It’s actually a tough thing to do. The plants are still full of life. We’ve spent so much time together. And then I have to be the mean girl, decimating the friendship just when they thought they could trust me. Cold and heartless doesn’t even begin to scratch the surface. Once hacked and packed, I carry them into the bomb shelter. My house was built in the ’60s, and behind a closet and under the front steps, there is a cement crawlspace, a bunker which we refer to as the bomb shelter. It’s cool and dry all winter, conditions that allow the tenders to go dormant. My effort to trick nature and turn Long Island into a summer tropical paradise began several years ago when a friend gave me a brown paper bag with canna rhizomes. She said just keep them in the garage and plant them in the spring. That didn’t work. The garage was too cold and too damp, and when spring arrived, I had a bag of smelly and shriveled canna. That’s one of the many things I love about gardening. The mistakes. Mistakes are there to help us to learn and to try and to keep moving forward. I read a few books, made a few more tries, and figured out what worked best for me. I had more success with peat moss than perlite. My tries with dahlias were hits and misses — make that lots of misses. But the canna and elephant ears were practically indestructible! It amazes me to think that as Joe and I go about our winter routine, shoveling snow, cleaning house, escaping to Florida, going to work, these plants are living in darkness. Sleeping. Holding on for spring, when they can feel the warmth and do what they were meant to do: bloom. 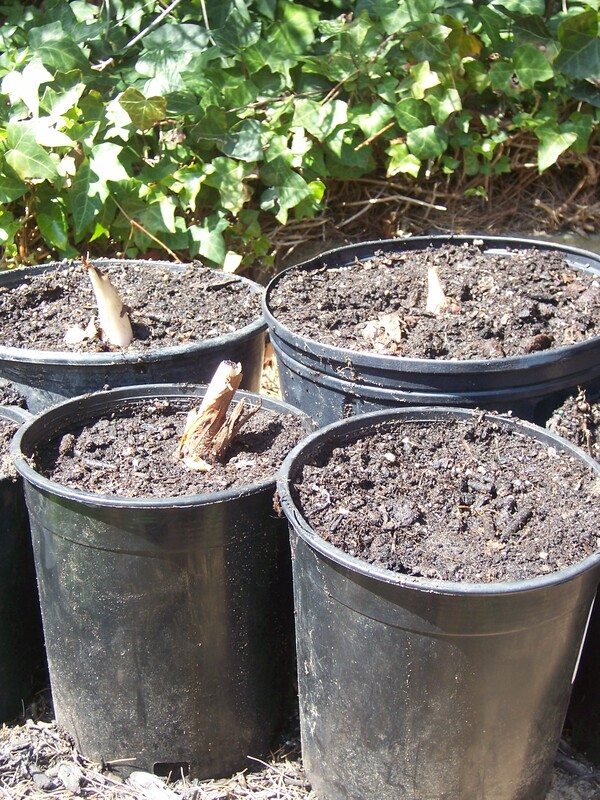 A full bucket of canna rhizomes. Gardeners are like tender bulbs. Maybe in the same way that people begin to look like their pets, maybe we also become the plants that we love. We spend the winter months combing over catalogs and viewing gardening shows, forcing amaryllis to bloom, dreaming of colors and foliage and home-grown vegetables, drawing out plans for new beds, anything to keep our gardening spirit alive. And we do this because we’re all waiting for the promise of spring, when we can emerge from our homes, feel the warmth of the sun, and bloom. So, this was the weekend that the bunker was opened, and I carried out bag after bag of tender bulbs. At this stage, I have limited myself to the most successful ones: elephant ears and canna. It was a long day of work. Lifting bags. Sorting bulbs and rhizomes. Planting. Watering. And looking forward to the day when they sprout, grow, and flower. I know we’ll have a beautiful summer together, as we become reacquainted with our routines: watering, deadheading . . .
Deadheading. Hmmm. That reminds me. These poor plants have no idea that in about five months, I’m going to turn on them again. I made the mistake of leaving some glad bulbs in the ground. I ended up with a pulpy mess that looked like boiled yams mixed with slug slime. Yucko. Last fall, I took the time to dig up all of the glads, cannas, and elephant ears and stored them all in the garage. I hope my garage was kinder to them than yours. I’ll find out next week, when I begin planting them. I also used to plant and save glads. But when I look around, I don’t think everyone is doing that. So one year, I kept them where they were planted (a sunny location), and so far, so good. I’ll keep you posted if they come up again this year. I’ll think positive thoughts for your garage-confined plants. Good luck! Hi! Thanks for visiting my blog. I’m happy to have found yours! I tried overwintering my caladiums last year and they are all mushy. I think my garage is too damp. That bunker of yours sounds like the perfect place! Its a lot of work to get all the bulbs back in the ground – I hope they show their appreciation soon and you’ll enjoy a season of blooms! Thanks for commenting! I also had a rough time with caladiums. I finally gave in, and now I buy fresh bulbs each year. They’re a great souvenir when I travel to warm climates in February. Ahh, elephant ears! I kept my first ever nanna plants and ears in a plastic bag this winter in the cold garage and last week discovered they were wet, shriveled, and even a little moldy! Yikes! Part of the fun of gardening is trial and error — although at the time it doesn’t seem like fun. Try placing them in brown paper bags, cover with peat moss, and store them in an area that stays cool and dry. Good luck! Do you have a segment for separating your elephant earbulbs? I containered one from the store already in bloom for this summer, and I just dig them up and cleaned them. I love, Love, Love elephant ears and hope that this is the beginning of more elephant ears! Hi Mindy. I usually separated them in the early spring. By then, they had dried off enough — and the bulbs could be easily separated from the parent bulb. No need to use a spade to slice through. Hope this helps.